Looking for affordable car rental at Daytona Beach Airport? Compare the prices of an enormous number of car rentals firms with pick ups offered at every major airport. Just designate Daytona Beach Airport as your desired pick up location and select your preferred vehicle type, the dates of your pick up and drop off, and the age of your driver. Submit your query for an instant quote and price comparison chart, with the option of booking online. Daytona Beach Airport is served by Greyhound buses, but there are no inbound rail connections. 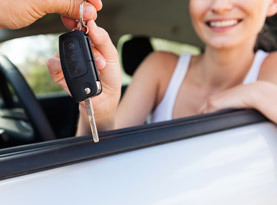 The most convenient way to connect from the airport to the city proper is with a rental car. Daytona Beach Airport is three miles from the city centre, and most rental car companies use this as their main pick up and drop off point. If you're looking for cheap car rental at Daytona Beach Airport, then it's best to begin your search early. Advance online booking takes the hassle out of the search and guarantees you'll get the vehicle of your choice. After picking up your Daytona Beach Airport rental car you can begin your tour of the city and neighbouring coastal cities. The beaches are the main attraction here, and you can choose from popular sandy stretches near Daytona Beach Airport or less crowded alternatives like those at Ponce Inlet or Ormond Beach. Daytona Beach Airport car hire is especially popular during racing season, especially leading up to the Daytona 500, when domestic and international racing enthusiasts bound for the speedway pour into Daytona Beach Airport. Temperatures at Daytona Beach Airport are warm year-round, with humid and rainy weather common between June and August. The best time to visit is during the spring and autumn months, when the waters are warm and inviting and the skies are perpetually sunny.